It is arguable that Byzantium never developed a theory of hereditary government. An emperor was considered fit to rule as long as he could keep power. As a result Byzantine history is full of emperors who were overthrown by their subordinates. Most emperors hoped that the crown would stay within their family, and there are a number of successful dynasties dotted throughout Byzantine history, but rarely did one family maintain control of the throne for more than a century before being toppled. A less talented scion of a successful dynasty would invariably fall prey to one of his ambitious subjects and find himself deposed, blinded, mutilated, banished to a monastery, or killed. Following such a coup the empire usually passed through a rapid succession of emperors until one strong enough to maintain power, and maybe found a dynasty of his own, arose from the pack of contenders. Occasionally usurpers found it expedient to link themselves to the ruling dynasty through marriage or co-rule rather than exterminating the family. The Macedonian dynasty, the most successful and long­-lived Byzantine imperial family, suffered the indignity of seeing three successful military men push the rightful emperor into the background. Establishing legitimacy within a political system that valued success more than birth, and that punished failure with uprisings and possible deposition, was important for any ruler, but it was doubly so for those rebels who managed to usurp the throne. The quest for legitimacy occasionally manifests in imperial portraiture, and so the lead seals of these usurpers provide an invaluable vantage on how they conveyed their authority. 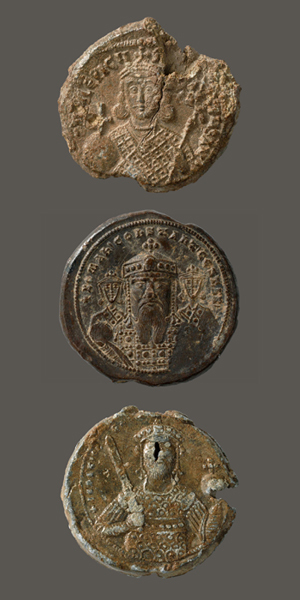 The two choices seem to have been conservation or innovation, and only rarely do we get a sense of incremental development of decoration and portraiture (see for example the seals of Basil I). Occasionally there was an essential conservation of the design program, as on the seals of Michael II, Michael IV, and Nikephoros III. Most interesting are those whose seals contrast sharply with their predecessors, for in them one may see a reaction to the past and a representation of the alternative that the usurper offers to the empire. The seals of these innovators are included and discussed in this section. For a discussion of other usurpers’ seals, see their entries in the timeline.